Today, Vladimir Putin was inaugurated to his third term as the Russian President after a landslide victory in March elections. Putin has bounced between his roles as Prime Minister and President for 12 years, but many have accused Putin and his United Russia party of rigging elections in the past. While voter fraud can be hard to detect, a group of researchers has carefully analyzed the official election data for clues and posted their analysis on the arXiv preprint server. The researchers found several questionable anomalies in the data that always seemed to support Putin and his party, casting doubt on the integrity of the recent elections. Dmitry Kobak, an engineering graduate student at Imperial College in London, led the team's analysis of government provided election data. The team found several major aberrations in data for the Presidential election held in March and the parliamentary election held late last year. In most fair elections, there is a slight correlation between turnout at polling stations and the percentage of voters who chose the winner. 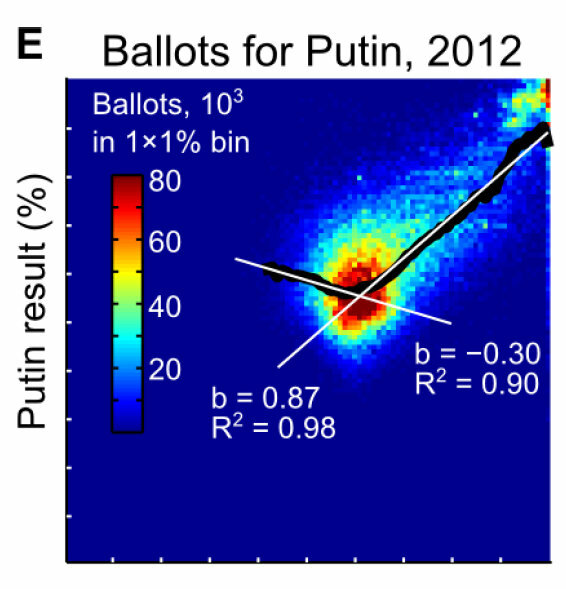 Russia's two recent elections, however, exhibited a distinct cluster of polling stations with voter turnout exceeding 95% and extremely high support for Putin and his politcal party's leaders. Data for Putin's competitors, on the other hand, did not show this same correlation. Fig. 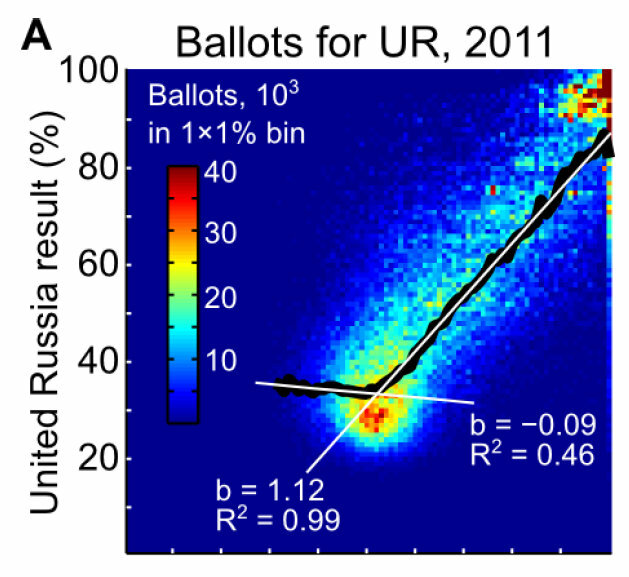 A United Russia's election result on the y-axis and voter turnout on the x-axis with red indicating high numbers of votes for UR. The graph shows a cluster of precincts with extremely high turnout (95 percent and up) and high support for Putin's party. Fig. E shows the same result for Putin's Presidential election. Both images courtesy Kobak et al. via arXiv.org. Kobak and his colleagues traced the results to nine regions within Russia that yielded approximately 3.5 million votes for Putin. But aggregating data from a wide range of urban and rural areas with differing socio-economic statuses could have introduced this anomaly in the data. To account for this potential explanation, the researchers broke the data down more narrowly, looking at the results for urban and rural areas separately. Independently, rural and urban areas had the same high correlation, and further analysis revealed that this cluster was an endemic feature of certain constituencies. These constituencies may have produced artificial election results, according to Kobak's group. In addition to the aforementioned correlation, the data reveal spikes in polling places that had round number percentages of votes in favor of Putin and his party. For instance, many constituencies reported that 65, 70, 75, or 80 percent of the vote favored Putin and United Russia. Non-round numbers, like 72 or 67, did not show similar spikes. Furthermore, Putin's competitors did not have similar spikes in support. Most notably, a large number of votes came from precincts with 99.5 percent of the voters supporting United Russia. The authors of the research suggested that these factors may indicate votes were rigged to yield a previously determined threshold of votes. In other words, election officials wanted to win by a certain amount, and they may have fixed the vote to an acceptable winning percentage. 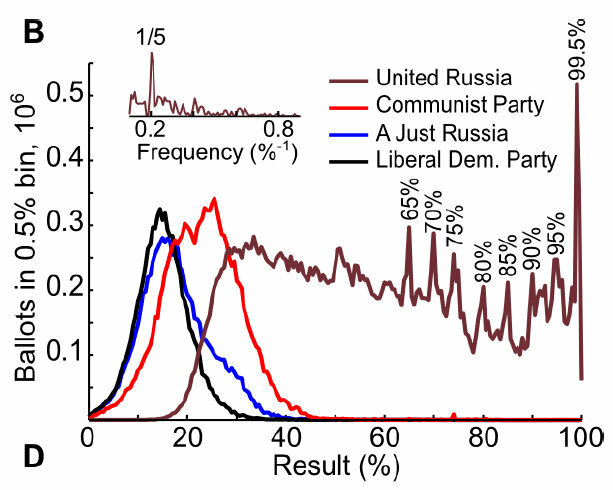 The amount of votes for United Russia and competing parties as a function of the percentage of voters supporting them. Notice the spikes in support around round numbers like 65, 70 and 75. Image courtesy Kobak et al. via arXiv.org. The first two factors definitely hint at some sort of wrongdoing, but there's even more revealing messages hidden in the data, according to Kobak's team. There were significant differences between paper-based results and electronic results. Furthermore, several regions exhibited strangely uniform results across many of their polling stations. Although this analysis does not conclusively prove the election was fair or not, it certainly raises several questions about the results. Russia has a long history of stifling dissent, and Putin's opponents have frequently accused him of unfair elections. Now, his opponents have one more piece of ammunition: statistics. From left to right, the top two images are courtesy of www.kremlin.ru and Bogomolov.pl via Wikimedia Commons.